In Agrícola Navarro de Haro we have more than 600 Hectares of farms distributed throughout all Spain, especially in Murcia, Almeria and Granada. We look for the best farms to achieve the best products in each season. The best products are only achieved with the best seeds. In Agrícola Navarro de Haro we know it and for years we have worked with the most prestigious international companies to get the best varieties in seeds. Just taking care of every moment of production, from planting to harvesting until you get the best product. Our team of engineers ensures the best maturation moment before harvesting. The key is to harvest at the right time, at the optimum time of ripening to meet the requirements of our customers regardless of the destination. It is the guarantee of the good condition of our products. 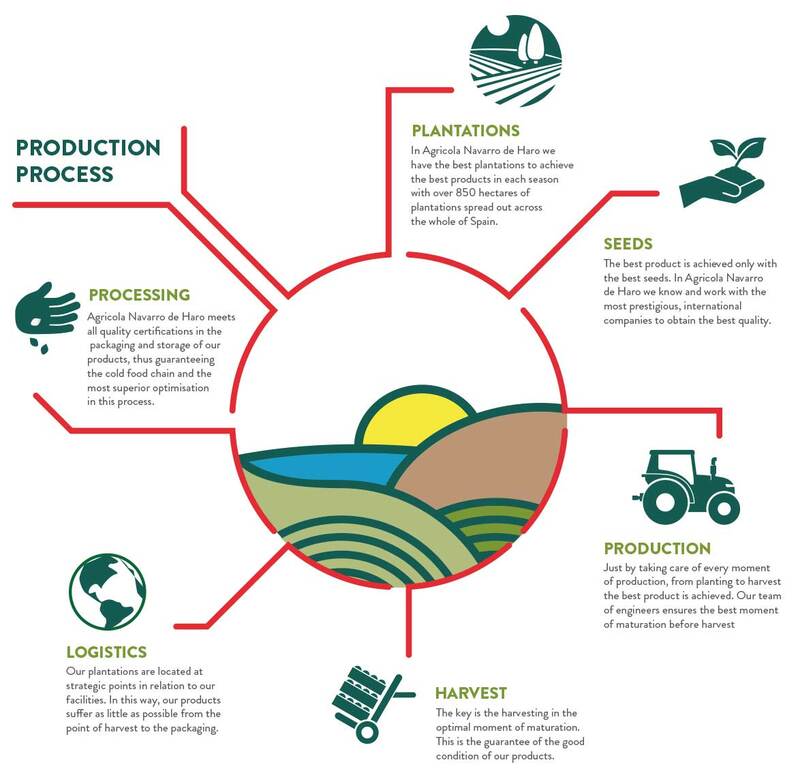 Our farms are located at strategic points with respect to our processing facilities. In this way, from the harvest to the packaging, our products suffer as little as possible. Agrícola Navarro de Haro meets all the quality certifications in the processing and storage of our products. Ensuring the cold chain and the greatest optimisation throughout the process. Our work does not end here, but the manufacturing process does, taking care of every detail for each product, guaranteeing in this way the proper exit of our products to their destination.